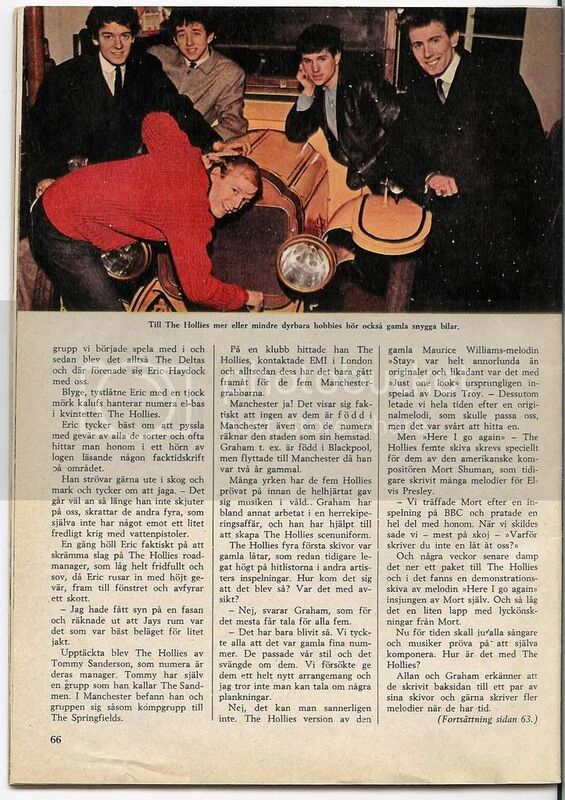 Here is an article from January 1965, before I discovered the Hollies, that I quite enjoyed reading, and translating. Here is the group with the numerous names. 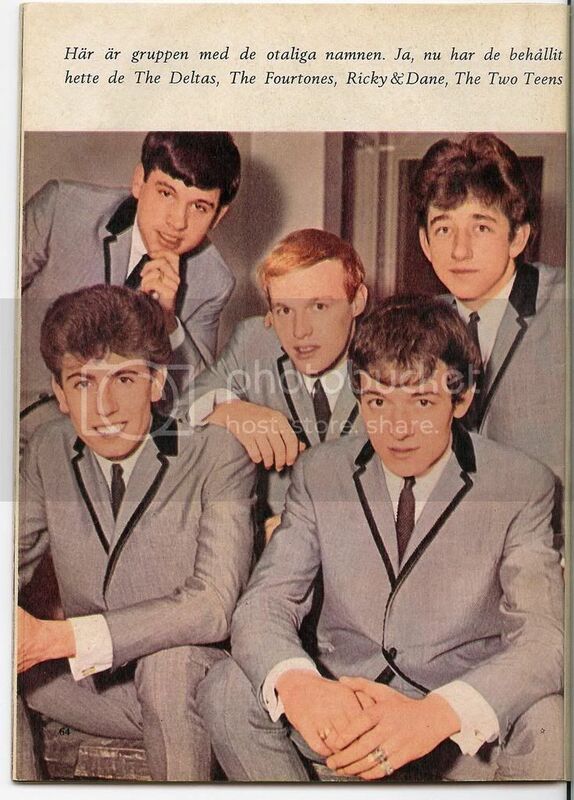 Yes, now they have kept the same name for a while: “The Hollies”. But before they became famous they were called The Deltas, the Fourtones, Ricky & Dane, The Two Teens and many, many other names. came up with the idea to call the group The Hollies, we all agreed, and so,The Deltas became The Hollies. Says the tall, handsome Graham Nash, rhythm guitarist and spokesman for the five men strong song- and instrumental group from Manchester. Nowadays, most bands come from Liverpool, but apparently not The Hollies, who entered the stage for real in autumn 1963, when their record “Searchin’” started to climb the charts. The Hollies are not a group that parents hate, they are not a group with long hair or a group dropping their pants or jumping high up in the air. There might not have been any The Hollies at all if it hadn’t been for Tony Hicks. When the group was ready to go to London for their first audition for a record company, they were lacking a solo guitarist and it was only after several attempts that they succeeded to persuade Tony Hicks to join them and quit his job as an apprentice electrician. -	Graham and Allan had asked me earlier if I wanted to start playing with them, but I said no. I thought that showbiz was so uncertain, and that it was safer to have a real job. I have always wanted to become an electrician and actually I often have use for my skills in that area now, when it comes to fixing microphones, loudspeakers and amplifiers. Tony, who is called Don Juan by the others, started to play the guitar when he was eleven. Skiffel was the dominating music then, and Tony played together with eleven other young lads in a skiffle group called the Skifflettes. A few years later Tony started his own group, which he called The Dolphins. - We got quite a lot of gigs in and around Manchester and also quite a lot of praise. Sometimes we got to play with visiting artists. For example Billie Davis and Dave Berry. The drummer with The Dolphins was called Bobby Elliott and nowadays he’s the one who keeps the beat with The Hollies. But the road to there was winding. who played modern jazz. By the way, that’s the kind of music I still like best. When I want to relax, there’s nothing better than putting on a record by Thelonius Monk, Duke Ellington or Cannonball Adderley and sink down in a soft armchair. Bobby couldn’t become the drummer of The Hollies from the start for the simple reason that they already had another boy sitting at the drum skins and what does a pop group want with two drummers? was the name of the drummer with The Hollies – suddenly decided to leave them, I never hesitated for a second to join Tony, Graham, Allan and Eric. A funny thing is that Don then took my place in The Fentones, so in fact we just swapped. So, The Deltas was the name of the group that eventually became The Hollies. The founder members were Graham Nash and Allan Clarke. At school, Graham and Allan used to perform in cabarets and parties and at clubs and pubs in Manchester. -	We changed names nearly as often as we performed and I remember that we among other things called ourselves Ricky and Dane and The Two Teens. The Fourtones was the name of a group we started to play in and later we became The Deltas and then Eric Haydock joined us. Shy, quiet Eric with a thick dark tuft nowadays plays electric bass in the quintet The Hollies. Eric enjoys handling guns of all kinds and you’ll often find him in a corner of the dressing room reading some trade magazine. He loves to go for a stroll in the woods and fields and likes to hunt. – It’s all right as long as he doesn’t shoot at us, the other four laughs, but they don’t mind a small friendly water-pistol war. Once Eric gave The Hollies road manager, who was sleeping peacefully, a real fright, rushing in with a raised gun, up to the window, firing a shot. -	I had spotted a pheasant and figured that Jay’s room had the best location for a bit of hunting. The Hollies were discovered by Tommy Sanderson, who is now their manager. Tommy has got a group of his own, called The Sandmen. In Manchester he and his group were accompanying The Springfields. In a club he found The Hollies, contacted EMI in London and since then everything has moved on for the five Manchester lads. Speaking about Manchester! It turns out that none of them are born in Manchester, even if they now count the town as their hometown. Graham, for instance, was born in Blackpool, but moved to Manchester when he was two years old. Many are the professions that the five Hollies have tried before they whole-heartedly gave themselves to music. Graham has among other things worked in a men’s clothes shop, and he has helped creating the stage uniforms for The Hollies. The first four records that The Hollies recorded were old songs, which already had been high in the hit lists with other artists. Why is that? Was it on purpose? -	No, replies Graham, who mostly speaks for all five of them. -	It just happened that way. We all thought that they were good old songs. They suited our stile, and they were swinging. We tried to give them a whole new arrangement and I don’t think you could say that we were copying. No, indeed you can’t. The Hollies version of the old Maurice Williams song “Stay” sounds totally different from the original, and the same goes for “Just one look”, originally recorded by Doris Troy. – Besides, we were always looking for an original song that would suite us, but it was hard to find one. But “Here I go again” - The Hollies’ fifth record was written especially for them by the American composer Mort Shuman, who has written many songs for Elvis Presley. And a few weeks later a packet arrived for The Hollies containing a demo record of the song “Here I go again” sung by Mort himself. And with it a small note with good luck wishes from Mort. Nowadays all singers and musicians are trying to write their own songs. What about The Hollies? Allan and Graham admit that they have written the b-side to a couple of their records and would love to write more melodies when they have the time. -	I always jot down words on all kinds of paper, Allan admits. We hope to be able to write a song that is good enough to become an a-side eventually. The Hollies indirectly got their name from Buddy Holly, but although all five members are great admirers of Buddy’s records, they haven’t included any Buddy Holly songs in their stage act. Wild, loud and ‘happy’ music is what The Hollies give their listeners. - That’s the kind of music that young people of today like to hear. It’s the old, wild rock and roll from the mid fifties that has come back, and we like it, and think that the good old rockers Jerry Lee Lewis and Little Richard are great! Bernard Jewry aka Shane Fenton aka Alvin Stardust is currently on tour in the UK. Great article and pictures. Thanks, Agneta! Missed this one before. Many thanks Agneta! 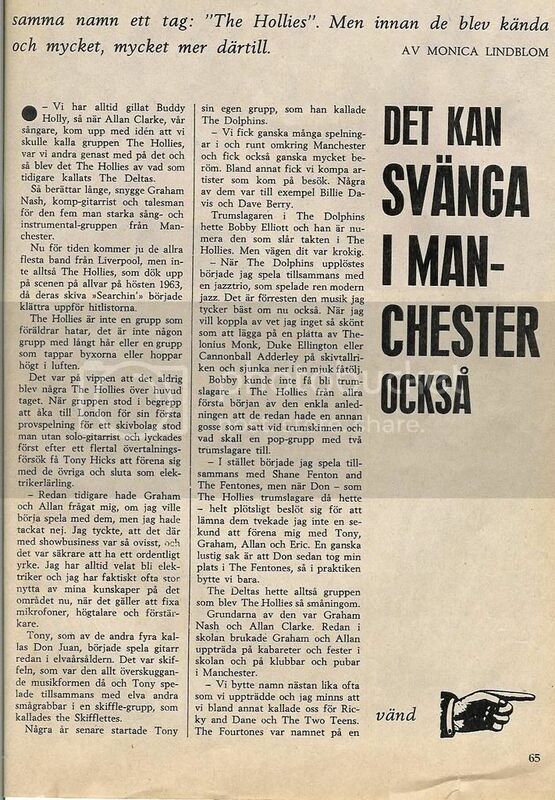 Yes, thanks; great article, Agneta! You're all welcome! I'm glad you enjoyed it.